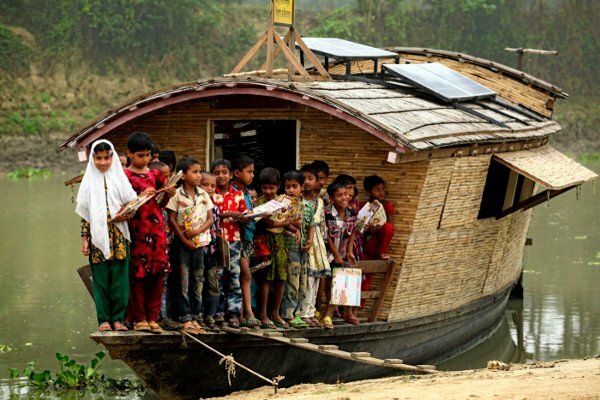 Until I read about Mosammet Reba Khatun from Bangladesh, I had never heard about solar-powered floating schools. 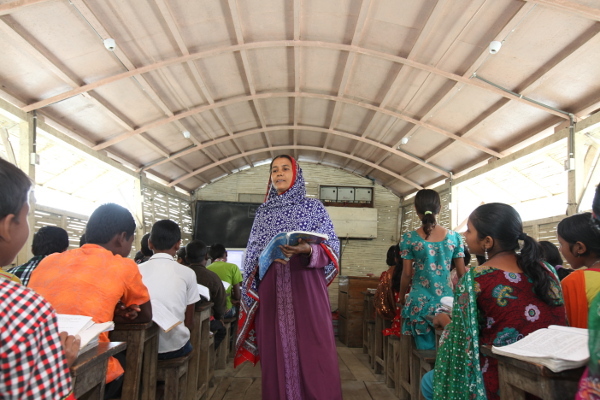 Mosammet teaches in a remote river basin where access to schools is very difficult, especially during the monsoon season. The boat is an interesting model for making education accessible in poor communities because the boat picks the learners up from home, sails off and returns learners home once their session is complete. Each boat is equipped with internet-linked computers and electronic resources. When a student performs well they are rewarded with a “scholarship” in the form of a SuryaHurricane solar lantern (a low-cost solar lantern made from recycled parts of the conventional and much-used kerosene lantern). Parents also receive on-board training on human rights, nutrition, health and hygiene, sustainable farming, and climate-change adaptations. Reading about Mosammet’s experience has revolutionised my understanding of what technology can do in providing access to education. The default position for technology in the classroom is related to the concepts of blended learning and “flipping the classroom” where the new rage is to expect that primary-school children should bring iPads to school. There’s nothing wrong with this model but it’s for a privileged context. Technology in the classroom has also been focused on the resources that can be made available in the classroom such as smart boards (overhead projectors) and audio-visual equipment in order for videos to be incorporated into teaching. These are important functions of technology in the classroom but when we consider the challenges many teachers and students face when it comes to basic access to education, technology can do so much more. In Mosammet’s context, technology is about creating access to education that would otherwise be unavailable in her poor community. Technology in education has also been seen as a threat because others believe that it will one day replace the teacher. If technology in education is about the use of gadgets and special apps, it’s limited in terms of what it can do. In poorer communities, radio and cellphones are central to creating access to learning. A personal experience with technology and education came in the form of a radio show “English in action” and story time with Gcina Mhlophe on the Xhosa radio station, Umhlobo wenene. “English in action” was a show for young children to learn English through weekly lessons and Gcina Mhlophe’s stories created access to African stories that weren’t available in library books. Access to interactive radio programming in countries like Pakistan has had positive effects on the learning outcomes of grade one pupils in schools categorised as isolated. In such remote contexts, radio addresses barriers to learning raised by distance, poor access to resources, and an insufficient supply of quality teachers and of teacher supervision and support. The question of the teacher and technology is highlighted here: rather than replacing the teacher, technology can enhance learning in areas where teachers themselves need to improve their skills and knowledge. Technology in the classroom cannot be the be all and end all for solving the problem with access to learning. The Education for All Global Monitoring Report found little or no correlation between greater general ICT (information and communication technology) availability in European and American schools and increased pupil achievement. A recent experimental study of 1 123 grade six to grade 10 students in 15 schools in California found no effect on grades or test scores. It would be interesting to find out what role the teacher played in this context. As a teacher, I’m still wrapping my head around the use of technology for better learning in my classroom. I’ve tried to use Facebook and twitter as alternative ways of interacting with my students and sharing links found on the internet. In the classroom we watch videos and if PowerPoint presentations are not incorporated into lessons, students are less inclined to pay attention. The younger generation has a different relationship with technology in the classroom; it’s a necessity rather than a luxury. They like interesting videos while learning about Shakespeare. My experience with technology in the classroom has shown me that there are more demands from teachers because learning can be more exciting when there are more resources available for teaching. In countries where accessing ICT is a problem (mostly because of electricity), cellphones have been introduced to encourage students to access to information. Cellphones do not require the same level of infrastructure as computers; networks are more widely available and phones increasingly have internet access and video capabilities. But while they can increase learning opportunities, these new technologies need to tailor content and delivery to the varying needs of learners, especially weaker students. My favourite example of this in South Africa has been the work of the FunDza Literacy Trust, which uses MXit to encourage reading. There’s no doubt that access to technology creates access to education. Given the findings of access to education in low-income countries, technology can do so much more for teachers and students. 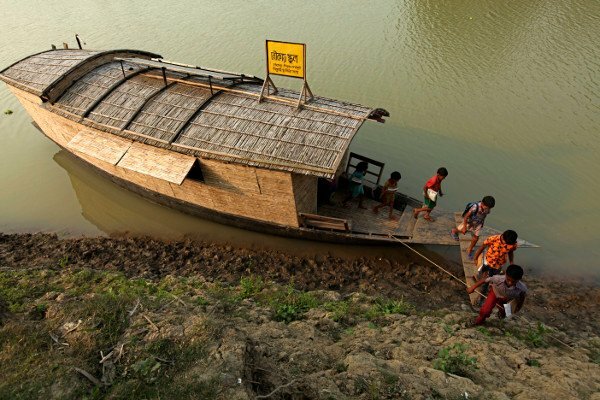 In Mosammet’s case, technology has transformed entire villages as the floating schools travel to students and provide education at their doorsteps.